RISE: Thoughts from an inspiring alum. A suggestion from a mentoring professor turned Gene Nelson from a confused psychology undergrad into a consummate librarian and eventually a member of the selection committees for the Caldecott and Newbery Awards. Photo Bradley Slade. 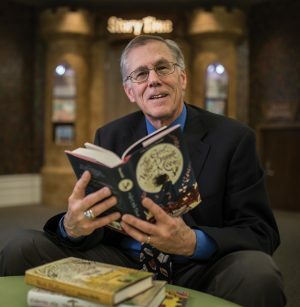 Provo City Library director Gene Nelson Jr. (BS ’78, MLS ’79) has twice served on the Caldecott Award committee and just completed a term on the Newbery Award committee, both a dream come true for a man who has spent his life surrounded by books. He’s been an elementary, middle-school, community-college, and public librarian and has helped build three different libraries, including the Provo City Library, the restored former Brigham Young Academy. He still finds time in his job to teach teachers about literature and to help select books that are best for kids. A subtle tale can inspire young readers to think, feel, and grow.